Greek Architects Panos Dragonas and Varvara Christopoulou have designed a traveller’s hideaway raised above the Athens rooftops. The project titled ‘Detached’ comprises of a nine square metres wooden cabin that is elevated on top of the city's rooftop landscape on four slender columns. There is no doubt that as the world is becoming increasingly urbanized and there exists no unexplored corners of the globe for a traveller to retreat to and it is with idea that the Greek Architects designed the Detached. 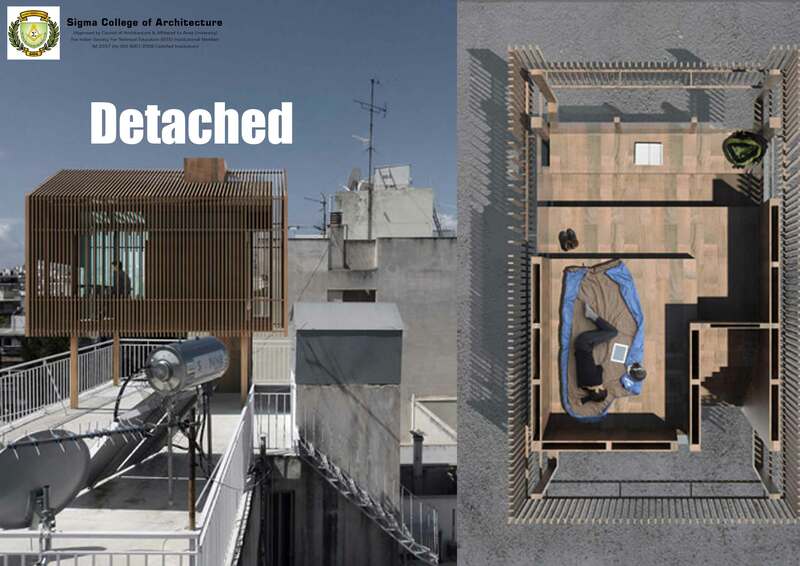 The designers imagine the structure resting on top of a Greek apartment building known as a Polykatoikia and it would cover only the basic living needs such as a raised sleeping area and a stepped floor that frames a desk. “The new structure allows for the minimum detachment from the suffocating environment of the contemporary Greek city. The urban hut creates a voluntary isolation cell over the ruins of the new Great Depression” said the architects.